1. The Captains of the West come to the Black Gate. 2. The Host is surrounded on the Slag-hills. 3. 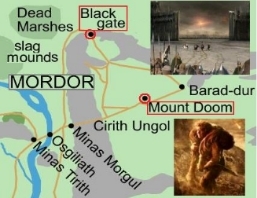 Downfall of Barad-dûr and the passing of Sauron. 4. Frodo and Samwise reach the Sammath Naur. 5. Gollum seizes the Ring and falls in the Cracks of Doom. 1. Birth of Elanor the Fair, daughter of Samwise. Launched in 2003 by the ‘Tolkien Society’, this annual event is a celebration of J.R.R. Tolkien’s works.